If you keep up with my reviews it will be no secret that I struggled through both Prince of Fools and Liar’s Key. Not because I didn’t like the story, but because I didn’t like the main character, Jalan. So I was trying to decide why it was I continued with the books when our view point grated on me so. 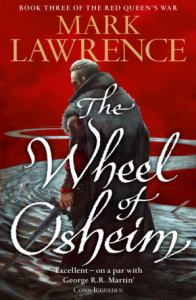 Then I looked down at my copy of Wheel of Osheim and saw the quote on the cover by Conn Iggulden: “Excellent – on a par with George R.R. Martin.” And it suddenly hit me. I disagree with that statement entirely. Lawrence is nothing like GRRM, but far more like Patrick Rothuss (by the way I hate Kvothe with the fury of a thousand suns yet I have read both books of Kingkiller Chronicles and even purchased a copy of Name of the Wind for my sister). What I’m trying to say here is that Lawrence is a poet. It’s his turn of phrase and the way his characters look at the world that keeps me coming back even if I don’t like the main character. That being said… I actually started to like old Prince Jal in Wheel of Osheim. Now I thought Liar’s Key suffered from middle book syndrome quite a lot. There was a large portion of the story where it kinda stalled and limped along for a while. It was entertaining to read, but kinda felt like it was struggling to actually go anywhere. Wheel of Osheim has none of that. From the gates it roars along at a wonderful pace and doesn’t really let up. I’d say it definitely has the most action out of the series and none of it feels forced or out of place. As for the characters. Well I’ve said I actually started to like Jalan in this book and I feel this was entirely by design. The idea that thought and will shape reality is hammered home quite often and I feel Jalan becomes more likable as the people around him, the people he has effected in his life, start to believe him to be more likable. Snorri is still Snorri; big viking, tortured past, likable to a fault. Kara and Hennan are as forgettable as they ever were despite being so important to the story in many ways. And the Red Queen and her Silent Sister are still 10 kinds of awesome. There are some truly wonderful bits of humour spotted around the book including one bit that I am certain is a reference to Monty Python’s Holy Grail. I truly hope I am correct in this. Not a long review, but I’m trying to do it without spoilers and I’m finding it quite difficult. One other thing I do want to point out is how like a wheel the whole thing is (get it?). Not just this book, but the whole series. Everything goes around and comes around and in the end nothing changes, except everything. Have you ever watched a series of The Wire? It’s like that. It’s all different, but the same. Yeah, OK, you kind need to read the books to see my point there. So, if you haven’t, you really should. Now I can’t be sure, but this book certainly felt like an end to the world Lawrence created with his Broken Empire trilogy. It feels like both series were always meant to be written and they are also meant to be read hand in hand. That being said, it feels to me like Broken Empire works with or without Red Queen’s War, but the same can’t be said the other way around. A big part of this is because Wheel of Osheim doesn’t so much put a full-stop as a semi-colon on the world… and after that semi-colon are the words Now read Broken Empire. I’m giving the Wheel of Osheim a 4.5, but I always round up. Expertly written and great fun to boot. Mark Lawrence is truly a masterful storyteller.